The amazing thing about this market is the lack of middle ground. One moment the euro is about to collapse, and everyone wants dollars, and the next moment investors are convinced the Greek story is over, and are ready to take on huge risks. 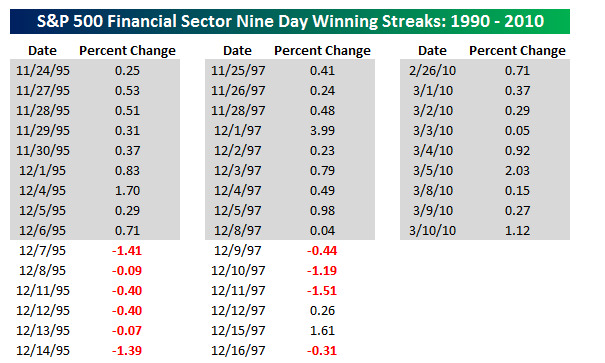 The latest case in point: Junk debt is rallying, trash stocks are rallying — see: AIG, Fannie Mae (FNM), Freddie Mac (FRE), and Citigroup (C) — as are financials in general. 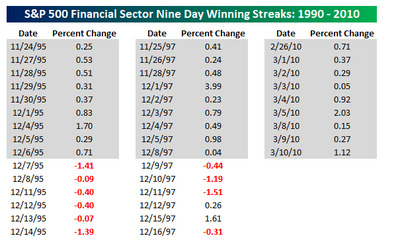 In fact, as Bespoke observes, financials are riding a 9-day win streak, only the third such streak since 1990.